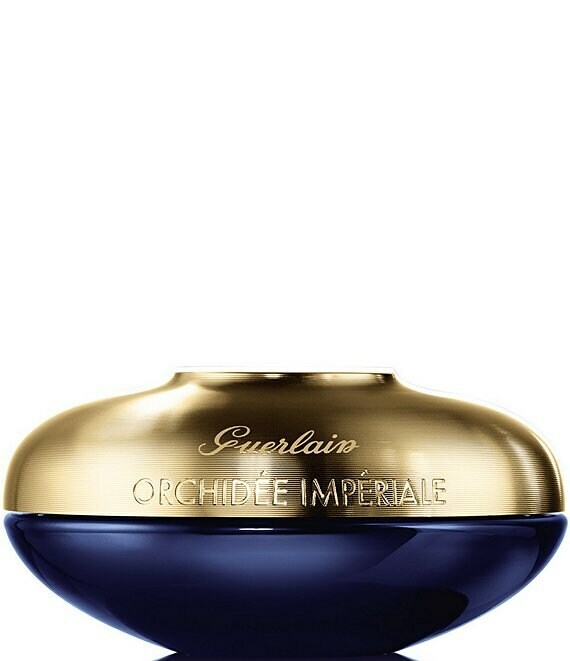 Orchidée Impériale by Guerlain has been offering women the best from orchids and science to benefit skin longevity for the last 10 years. The Cream is now enriched with Cell Respiration™ technology that is even more effective, thanks to a new duo of orchids. It helps to regulate cell respiration in order to maximize cells' energy production and therefore accelerate their regeneration. All visible signs of aging are reduced: wrinkles and fine lines fade away; the skin recovers firmness, density, and elasticity. The complexion is even and more radiant. A new breath of youth for the skin. Luxury and modernity are the watchwords for the product's new presentation, while its eco-friendly design minimizes its environmental impact while retaining the same volume (carbon footprint: -58%). Application: Use Orchidée Impériale Cream after the Lotion and the Longevity Concentrate (each sold separately). Take a small amount of texture using the spatula before applying in circular movements. Ingredients: The Orchid, a rare and precious raw ingredient, is the very essence of the complete and exceptional Orchidée Impériale skincare range. A genuine longevity prodigy, the orchid is the most developed species in the plant kingdom. Convinced of its exceptional potential, Guerlain devoted its first research center to it (something that had never been done for an ingredient): the Orchidarium®. This globally-unique research center reveals the prodigious powers of a duo of orchids made up of Gastrodia Elata—an essential orchid in Chinese traditional medicine—to form the core of the new Cell Respiration™ technology found in Orchidée Impériale Cream. Guerlain Research has now added a precious diamond powder for an instant boost of sophistication.